Nissan has recently claimed that it has developed a system that allows an electric vehicle to supply electricity to your home. According to the company, Nissan Leaf’s electric car can run home appliances for up to two days. The Nissan Leaf, equipped with the Leaf to Home System, will be able to be used as an emergency backup by people in case of any emergency or power blackout. Nissan is planning to commercialize the Leaf to Home System in Japan by 2012. If the Leaf to Home System is used regularly, it could help reduce electricity bills as well. The problem of power outages and shortages were very rare in Japan until this year. However, due to the disaster at the Fukushima Daichi nuclear power plant, Tokyo Electric Power generation capability has suffered greatly. The potential shortfall in electricity supply due to the earthquake and tsunami has put the country on a power-saving mission. According to Nissan, the Lithium ion batteries in the car can store upto twenty-four Kilowatt hours of electricity. The energy is sufficient to provide an average Japanese home with electricity for up to two days. 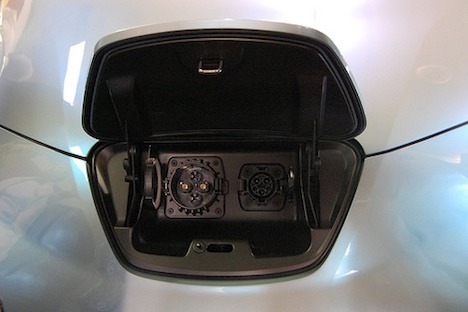 The Leaf to home System is a two-way charging system. It allows the Nissan Leaf to be charged overnight when electricity is cheap and abundant, and then supply electricity from its battery to the home when needed. The system works by linking the Nissan Leaf to the house’s electricity panel via a quick charging port. According to the head of the company’s zero-emission vehicles, Hideaki Watanabe, the power control system will also allow households to charge their home appliances from electricity stored in the battery of the leaf. The vehicle-to-grid technology introduced by Nissan can reduce the strain on power-generation facilities. If the system ever works with a large population, it will become adaptable to fluctuating demand.